A dozen boys, ages 11-16, and their 25-year-old coach became stranded when they went exploring in the cave after a practice game, only for the cave to flood. Rescuers have mounted a daring underwater rescue. 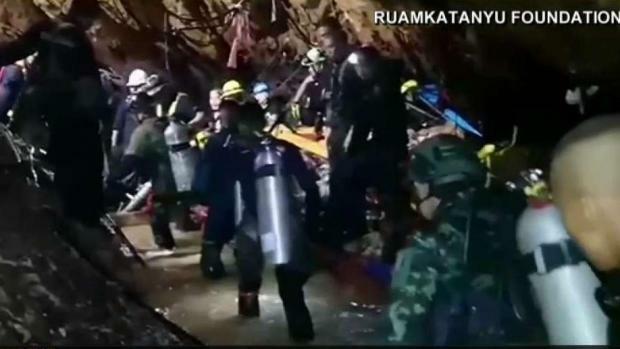 Four more of the youth soccer players trapped for over two weeks in a flooded cave in northern Thailand were brought out on Monday, an official said, bringing to eight the number extracted in the ongoing high-stakes rescue operation. "The eighth person is out and the operation is done for today," Sitthichai Klangpattana, flag officer to Thailand's navy SEAL commander, told The Associated Press. "Four boys were brought out today." They are "safe and conscious" and now in a hospital, Chiang Rai acting Gov. Narongsak Osatanakorn said at a news conference. He added that Monday's operation took less time than Sunday's because of the experienced accumulated and more people involved. After Monday's rescue effort, four boys and their coach were still inside the labyrinth cave. Narongsak said he's not sure if the remaining five people will be extracted in one or more operations. On Sunday, when the high-risk rescue operation to rescue the 12 boys and their coach began, teams of divers brought out four of the boys but waited several hours before confirming their safe rescue. Narongsak said earlier Monday that the second phase began at 11 a.m. (12 a.m. ET) and authorities "hope to hear good news in the next few hours." The four boys guided from the cave Sunday in an urgent and dangerous operation that involved them diving through the cave's dark, tight and twisting passages were happy and in good health, authorities said. 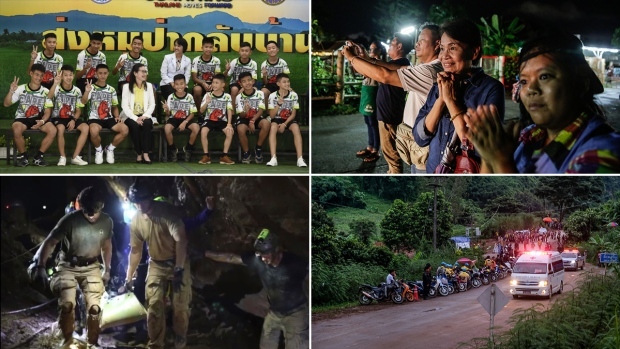 Four boys have been rescued from a flooded cave in Thailand, but the remainder of the soccer team and coach remain trapped in a cave. Carolyn Johnson reports live from Thailand for NBC4 News at 11 p.m. on July 8, 2018. Four young soccer players were evacuated from a Thai cave after their team and coach became stranded when they went exploring in the cave more than two weeks ago.